Hey winter, you’re not the boss of me. 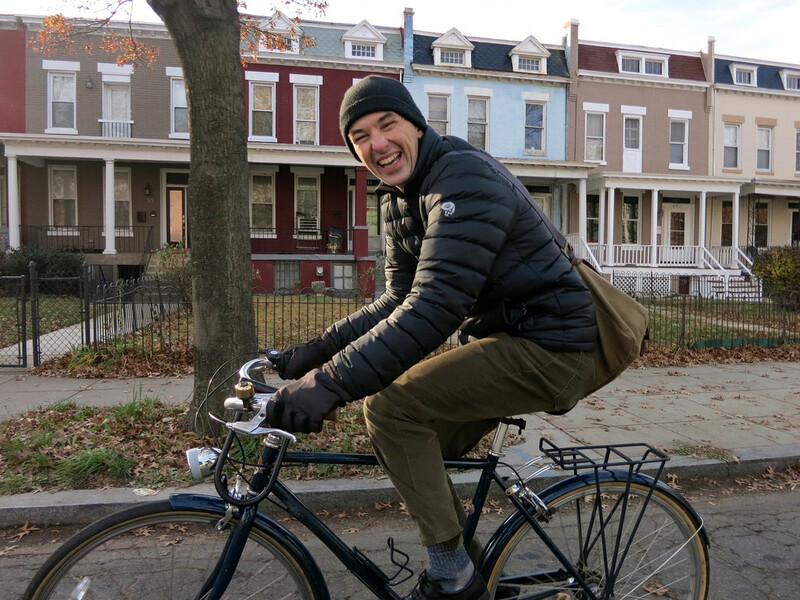 It’s time for a March challenge designed for the utility cyclist with errands to do, even during cold winter days– the Errandonnee! Errandonnee: Complete 12 errands in 12 days and ride a total of 30 miles by bike between March 5-16, 2015. Since we must run errands, anyway, let’s take the opportunity to recognize the utility cycling we often do, but seldom celebrate. Conceptually, these two words may not initially fit well together, but string 12 errands together for one long ride interrupted by sleep and other diversions, and you have… an errandonnee. Errandonnee is almost as much fun to spell as Mississippi so how can you not want to participate in this challenge? Of course, as this is a Chasing Mailboxes challenge I’ve added some rules. These may initially look like a lot, but I think after you read through them you will find this challenge to be quite manageable. Complete 12 errands from Thursday, March 5 through Monday, March 16, 2015. Complete the Errandonnee Control Card as you go (many thanks to @americancyclo for creating this!). You can save a copy of this control card for your use or make your own. There is no minimum length for each errand, but you must complete at least 30 total miles of bike riding over 12 days to successfully qualify for the Errandonnee. That’s an average of 2.5 miles per errand. Complete all 12 errands by the end of Monday, March 16. You can ride all 12 errands in one day, do one errand per day, or any other combination that works for you. You must complete errands from at least 7 of the 9 categories represented on the Errandonnee Control Card. Each category may be used a maximum of two times. For example, you may count a ride to work a total of two times. The Wild Card errand is for any trip you make that does not fall into any of the categories listed on the control card. If you carry a baked good for the “You carried WHAT on your bike? !” please provide a before and after photo. Please provide a short description of your Errandonnee bike (or bikes!). If you have a blog, you can post them there and send me the links. You may also use a site like flickr or Picasa and link me to your photos. You can send me the links to your Errandonnee tweets. Finally, I will accept 12 photos via email if that works best for you. There are no geographic limitations on the Errandonnee. OK, one limitation. Earth. All participants must be from somewhere on Earth. If the Errandonnee stresses you out or offends you or makes you feel bad or sad or competitive, you should stop. This is supposed to be fun and if you are not having fun then please do not continue because that is not what the Errandonnee is all about . That’s what family is for (KIDDING!). Deadline for Errandonnee submissions is midnight or so in your area, March 24, 2015. Submit all Errandonnee paperwork, including your Errandonnee Control Card to me at gersemalina “at” gmail.com. Send all qualifying rides together. That is, send me all 12 in one go, NOT ride 1, ride 2, etc. 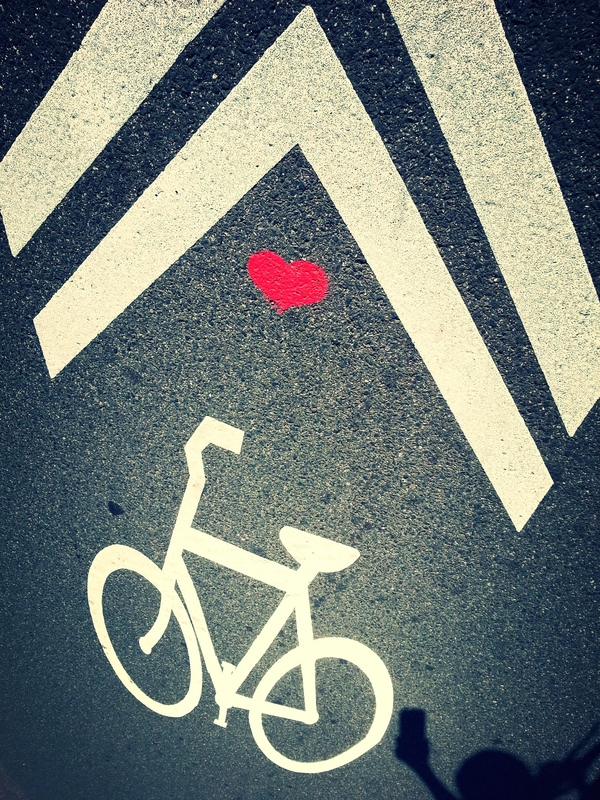 Everyone who successfully completes the Errandonnee is eligible for a prize. The premium will cost $4, which covers my costs. To purchase your prize, you may PayPal me at the gmail address above, or send your money by snail mail like grandma used to do (email me for my address). If you are an international entry, your premium will cost you $5 via PayPal. Please include a snail mail address in your submission so that I may send your Errandonnee swag to you. Note: prizes will be the same patch design as last year. Also, please feel free to tweet or Instagram as you go using the hashtag #errandonnee. Remember, errandonnee is a word with triple double letters. Two r’s, two n’s, two e’s. If you have a blog and errandeur, please let me know in the comments so I can put together an Errandonnee blogroll! I have an additional Q&A post here. If that still doesn’t address your question, ask in the comments of this post or send me an email. 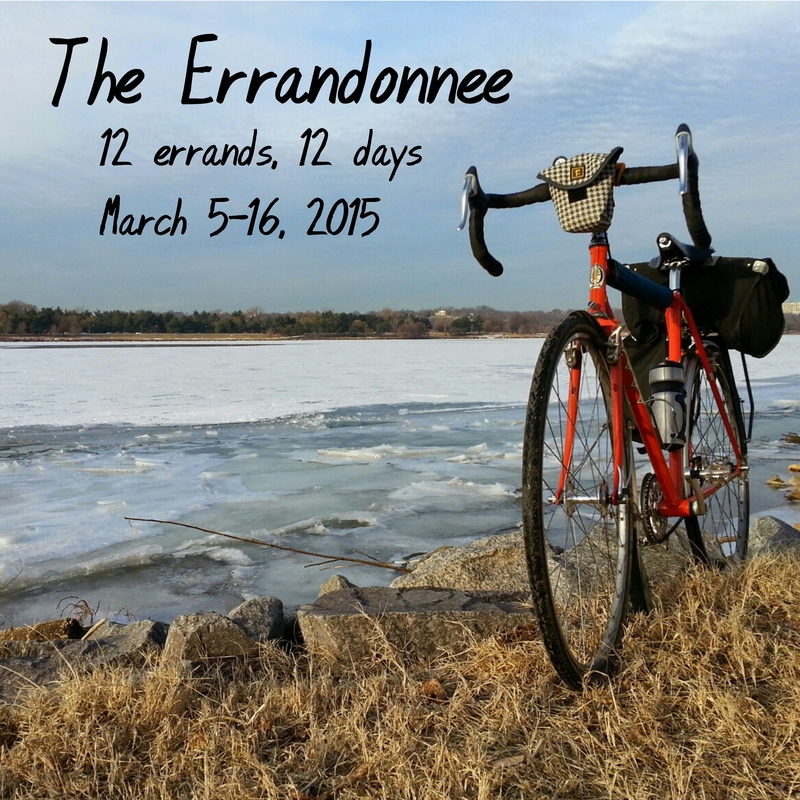 The Errandonnee: March 5-16, 2015. It’s time to ride and get stuff done. So in. You realize with #8 you’ve just given me an excuse to perfect my cupcake-transport system. You see how helpful this challenge is? Cupcake commuting research time! IN!!!! I’ve needed something like this to get me back on the bike after this bitterly cold February! 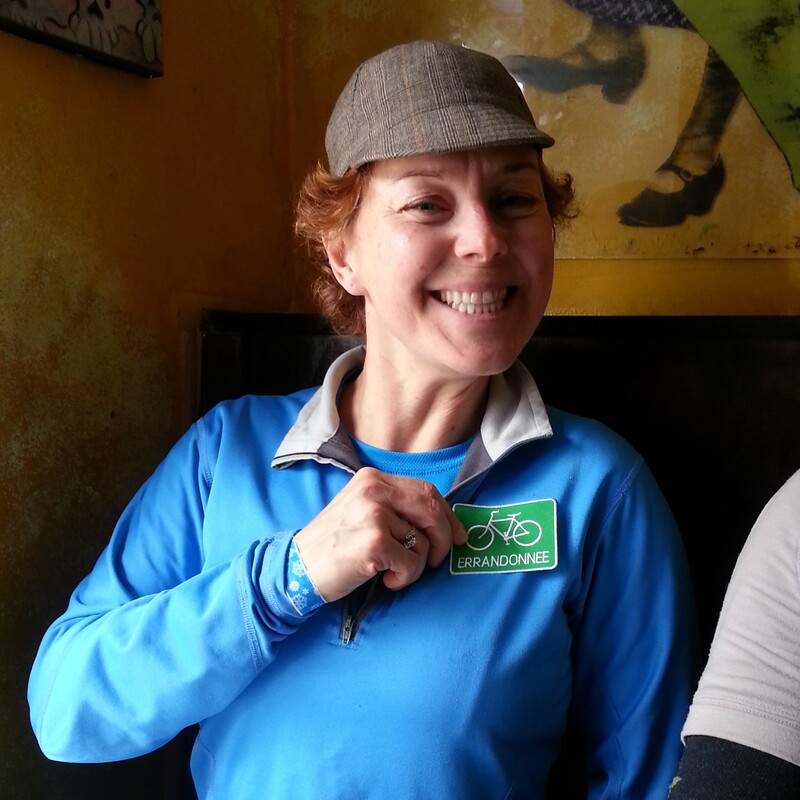 It will be similar to the green errandonnee patch, correct- not the same one? This year will be a challenge- I don’t have anywhere to ride! I think my husband may also be off that entire week to burn vacation time. This will be interesting. I can’t wait! Glad you are back for another Errandonnee! For this year, it will be the same design as last year. Usually I change it up, but not this time. So, if I ride to visit my husband at work and we discuss work to be done at home, does that count as a “work or volunteering” ride? :O) I’ll do anything to stretch rules. Ha! Then you need to talk with Jimmy Phoenix, master rule bender! SO doing this! Anyone else?? Sounds like fun–but it is snowing another 5 inches, then freezing rain, and sleet. No warm weather in sight. Any chance of a say 2 week postponement? If not, will do all 12 errands on the last day. See how it goes, and if you need to make a snow day appeal to the judges, you can. I hear they are very reasonable when considering such requests. About the pics: I do have Picasa, which I do not use so often, but Instagram I sure ly use, so would it be possible to send links to Instagram pics? Yes, perfect! I’m on Instagram, too, as @coffeeneur, so I’ll look for you. *thumbs up* I’ll give it a go. Can one destination/trip serve more than one errand? Say, getting groceries (store) and also having lunch there (personal care or personal business or wild card). I would say you could do that in a pinch, as long as you aren’t doing that for all of the errands, e.g., I went to the shopping mall, rode 30 miles, and completed all 12 errands. If you do multiple errands on one trip, the mileage would only count once though, correct? For example I just commuted to work but I also stopped at Walgreen’s and bought some shoelaces. So I’ve got going to store, going to work and personal care. Total round-trip work to home 8 miles, not counting the train. I’m actually only going to input the work trip, because I am pretty car-lite so need for me to combine. (One of my bikes is a Xtracycle so I can’t wait for the “You carried what?” category) But as a rule point, how should that be entered on the control card? I’m thinking enter each trip, but divide the mileage by number of errands in the trip. So if it were three categories completed on one trip, with a total of 8 miles, that would be entered as 2.67 miles per trip, 8/3 = 2.67. I like your “not counting the rain” note. Yes you are correct on all counts. Count total miles and divide across all errands. I have been thinking about signing up for this challenge since you first posted it. It sounds fun, but I didn’t know if I could finish all the categories. I guess I am going to give it a shot and see how I do. Thanks for doing this. I’m in. I knew there was a reason I put a basket on my Ogre. This looks great, thanks for organizing it all! I am going to do my best and I will be blogging about on https://bikelikecrazy.wordpress.com/. So do I send you a link for every post? And should I use the tag errandonnee in all my errand posts? So glad you will be doing it! When you send me your control card/entry, you can add the links to your errands there. Okay, thanks! I am ridiculously excited for Thursday to roll around. Oh, and yes, tag the post with Errandonnee! Thanks! I’m so in but one question that has arisen as I’m planning my errands. I live outside Seattle but was planning a sketching get together in Seattle next week. If I bus there, then bike to the location can I still count that? Obviously I would only count the biked miles. Is this still legal? Yes, multi modal is totally acceptable, as long as you only count the miles you biked. Conclusion: you are still legal. I’m in once again at http://locojoe.com . Should be fun! I just noticed: no night ride requirement this year? No, I took it out. Most people do at least one errand at night, anyway. What do you think? Should I put it back in next year? Just discovered your Errandonnée challenge. Love it! Will have to do this next year, or whenever the next one might be. Doing 30 Days of Biking (30DOB.com) again, which is similar but different.